Suffering from landing page envy? See how you stack up with a free benchmark report! 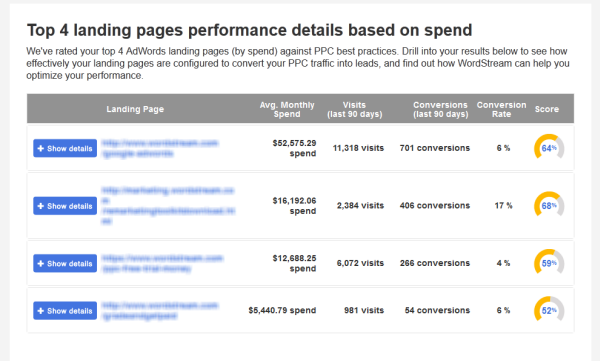 I love WordStream's AdWords grader. Some of my best and sharpest customers use WordStream's management software and report outstanding results. When you're able to squeeze more juice out of Google AdWords with less time, it frees you to work on even more profitable, bigger-picture stuff. Highly recommended. Why perform a PPC landing page audit? The quality and performance of your landing pages affects your Google AdWords Quality Scores – the “grade” that Google uses to determine how well your ads rank on the search engine results page, as well as how much you pay per click. Since your Quality Scores have such a big impact on the success or failure of your PPC campaigns, it’s crucial to get the landing page component right. After all, without effective landing pages, you can’t seal the deal. It doesn’t matter how good your ads are if your landing pages don’t work. Find out how your landing page conversion rate compares to industry benchmarks. It’s hard to find reliable data on what qualifies as a good conversion rate for PPC. Our industry-specific benchmarks give you a competitive baseline to measure against. Find out how relevant your landing page content is, based on spend. This free Marketing Grader checks to make sure your landing pages include top keywords, which demonstrates relevance to both Google and your visitors. 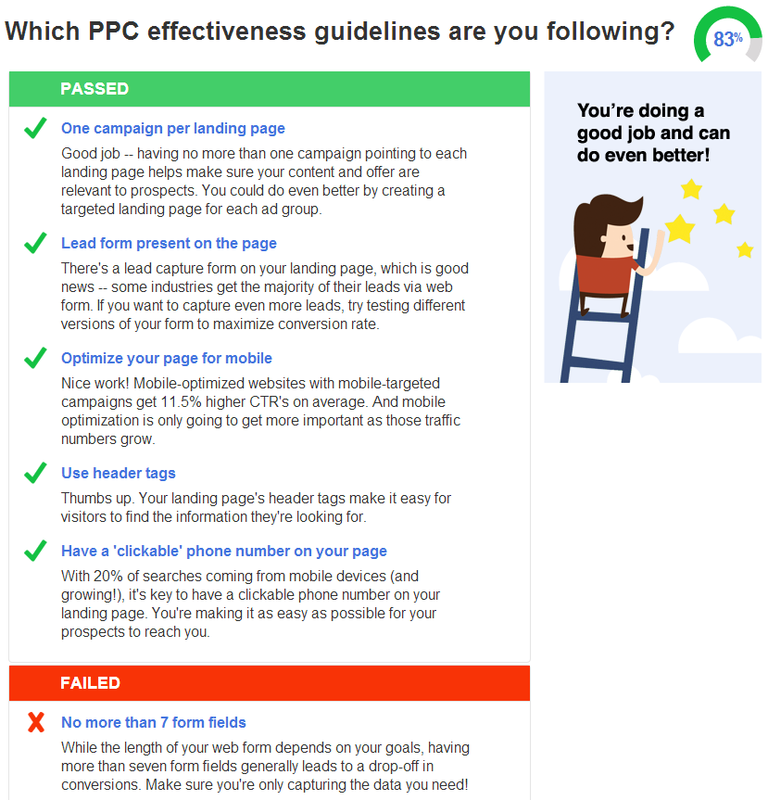 Make sure your landing pages follow PPC best practices. The Landing Page Grader checks to see if you’re following AdWords-specific best practices for landing page optimization. For example, do you have multiple campaigns pointing to the same landing page? (This is a no-no.) Do you have a clickable phone number on your page? See if your landing page forms are optimized for conversions. 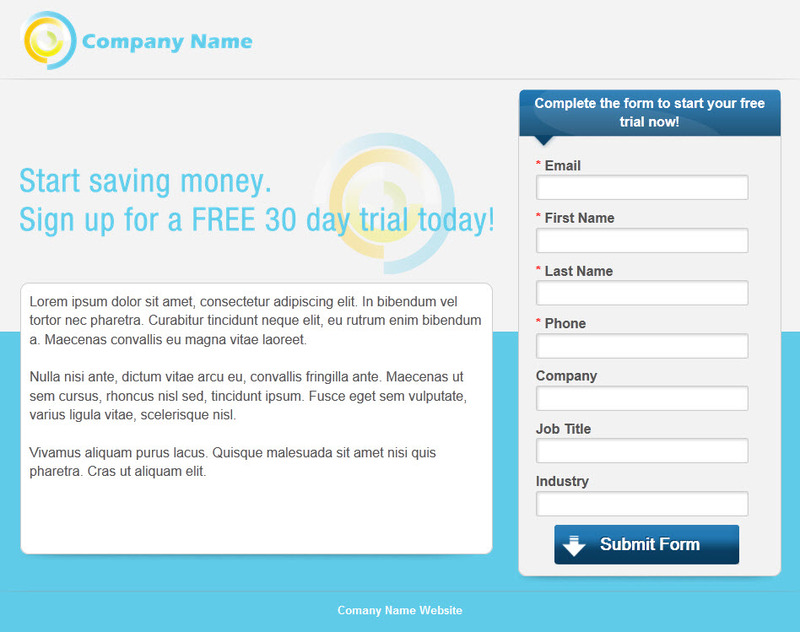 Is there a lead capture form on your landing page? If your form is too long, you’ll see a big drop-off in conversions. Find out whether your PPC landing pages are optimized for mobile. Mobile traffic is growing exponentially, and already accounts for about 1 in 5 Google searches. Optimizing your landing pages for a mobile experience will increase your CTR’s by 11.5% on average. 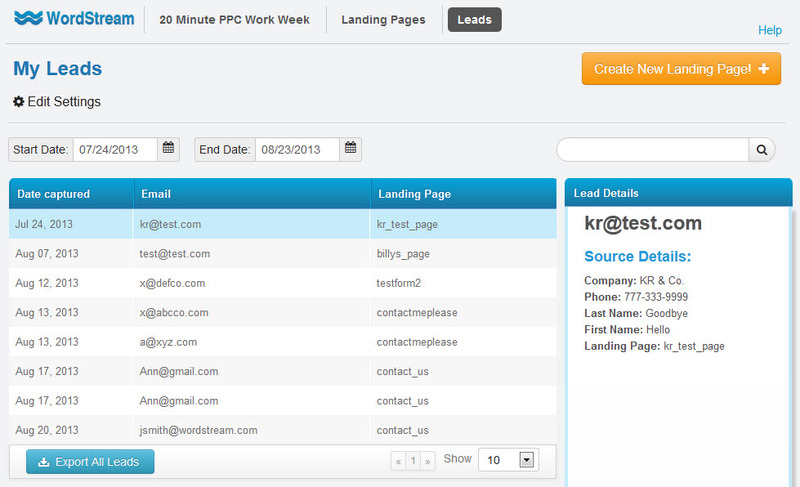 This is just a preview of the insight you’ll get when you audit your landing pages with the new landing page tool. You’ll also get actionable tips for improving your landing pages, raising your landing page conversion rates, and getting more return on investment from PPC. 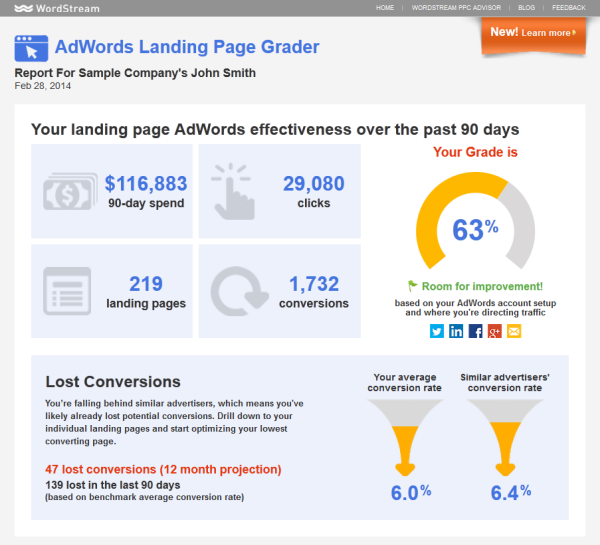 The Landing Page Grader works very much like WordStream’s AdWords Performance Grader: first, connect your Google AdWords account through a 100% secure, one-time OAuth connection. The tool wil quickly assess your account history over the last 90 days and identify your top five landing pages in terms of spend. It crawls those landing pages checking for marketing best practices and content relevant to your AdWords PPC campaigns. 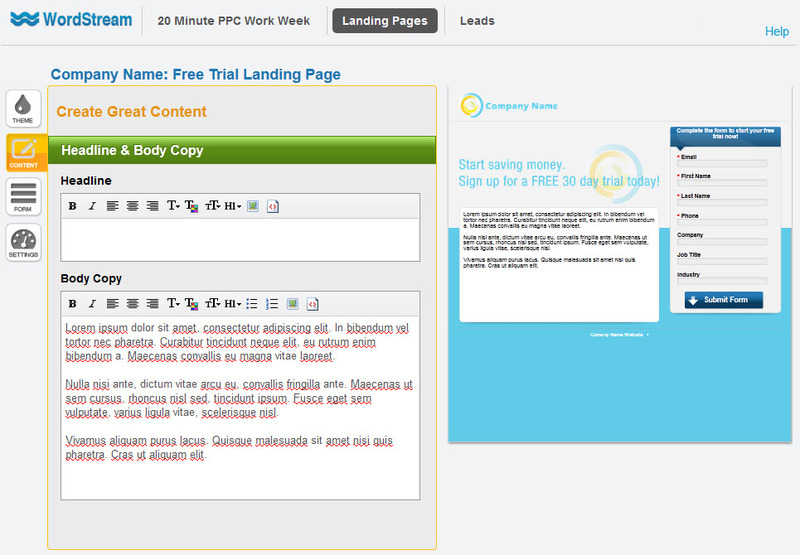 You’ll also seen individual conversion rates and performance scores for each of your top five landing pages. The content relevance section checks to make sure that your top keywords appear in the content on your page. A lack of relevant content can have a big impact on both your conversion rates and Quality Score. Your free landing page report provides deep insight into what happens to your potential customers after the click. Make sure that you’re not paying for traffic that abandons you once they reach the landing page! A landing page is the first page you reach after you take action by clicking on an advertisement or an offer in an email. It’s called a landing page because it’s the place where you land on a website, often the first interaction with that website. The goal of a landing page is to convert the prospect into a lead or customer. Landing pages should be single-minded, and everything on the page should work toward that goal. An eye-grabbing, persuasive headline that reinforces the offer your visitor has just seen in the advertisement or marketing campaign that got them there. Effective landing pages are focused on a specific offer – they’re not broad enough to apply to lots of different kinds of traffic, like your home page. The visitor should be able to understand the point of your landing page within a few seconds. Clear, concise copy that tells the visitor what value they’ll get by acting on this offer. Describe the benefits of the product or other offer (such as a downloadable guide) that your visitor is considering buying or signing up for. Don’t bog them down with too much information or make them scroll. A form designed to collect key information from your visitor, such as name and email address – but not so much information that it deters them from continuing. Overly long forms with too many fields will lower your conversion rates. A highly visible, clickable button with a call to action, or CTA – something like “Register Now” or “Add to Cart” that clearly tells the visitor what they’ll get in return for filling out the form. Good landing page design is clean and crisp and makes converting as easy as possible for the prospect. The form and the button should be clearly visible above the fold (meaning, they don’t have to scroll down to find them). A PPC landing page is a landing page created specifically for use in your pay-per-click advertising campaigns. The PPC landing page is where a visitor will land after clicking on your paid search ad in the Google, Bing, or Yahoo search results, or a PPC ad on a Google partner site, or a banner or remarketing ad on the Google Display Network, etc. Aligning your PPC landing page with a keyword group. Using keyword-rich copy on your PPC landing page. Using similar imagery and color schemes in your landing pages and display ads. Loading quickly to avoid Google Quality Score penalties. 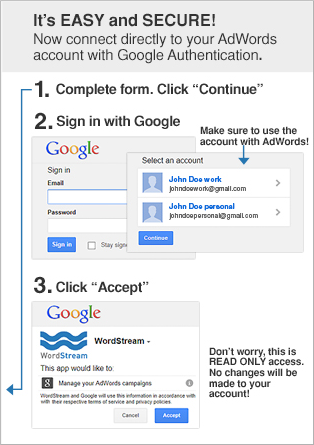 What Are AdWords Landing Page Best Practices? DO use keywords on your landing pages. 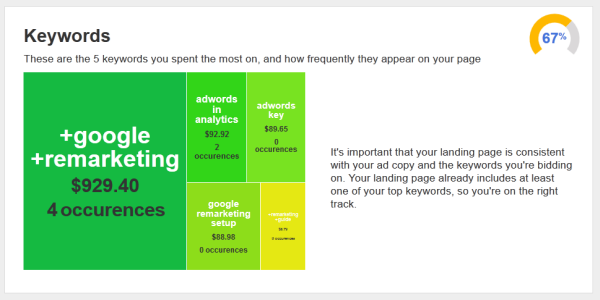 Google is looking for close relevance between the keyword you’re bidding on, the ad, and the corresponding landing page. DO test different colors and sizes for your button. DO include an image of the product or offer, or an explainer video that visitors can watch. DO include a company logo on your landing page. DO create mobile-optimized landing pages for your mobile-preferred ads. DO try using trust symbols and testimonials to assure your prospect that your business is trustworthy. DON’T use “Submit” as your CTA. DON’T send all your traffic to your home page. DON’T use colors and images that clash with your regular website design. DON’T put too many links on your AdWords landing page – you’re just giving the visitor options to leave your page, which could prevent them from completing the action you really want them to take. DON’T try to collect more information than you really need – too many form fields scare prospects away. More than 7 fields is a CRO no-no. DON’T use a two-part form without telling your visitor about it. What Are the Principles of High Converting Landing Pages? They are targeted to a specific offer and keyword. They have a strong, persuasive headline – this is the first thing a visitor sees and sometimes the only thing they really read. They include a strong image or a video that demonstrates the value of the offer. They quickly outline the benefits of the offer. This text should be easy to scan – think bullet points. The button is big and bright enough to stand out on the page. All the important information is above the fold. They include testimonials or customer logos to demonstrate trust and value. They have been through a battery of landing page testing to make sure no conversion rate stone is left unturned. What Is Landing Page Testing? Remember, best practices are only guidelines. It’s key to test your landing pages to make sure that your landing page design works with your specific audience. The easiest way to discover the best design for your landing pages is via A/B testing. An A/B test splits traffic between two versions of your landing page, so that you can see which of the two designs performs better, especially in terms of conversion rate. Test one element at a time. Otherwise you won’t know which change is responsible for the uptick or downtick in your conversion rate. Test different versions of your headline. Try longer or shorter, different verbs, etc. Test different versions of your form. This might include more or less fields, different types of fields, or a different order. Test different versions of your landing page button. Try changing the color, size, and shape of the button. Then test the CTA (call to action) on the button. Try moving the elements of your page around. The form often appears on the right side, but some pages work better when the form is on the left or right in the middle of the page. Try adding visual cues that point viewers to the form/CTA. These could be overt, like arrows, or more subtle, like an image of a person who is looking in the direction of the form. Test adding, removing, or changing the location of navigational links. These links might appear in the header or footer. You could also try changing the number of links. Test the addition of testimonials. Try a customer quote with or without a photo of the customer or the customer’s company logo. You can also move the location of the testimonial to see where it gets the most traction. Remember, anything that you put on your landing page can be tested and improved! Landing pages for lead generation: Businesses using PPC to generate leads (for example, lawyers, dentists, other service professionals, and many B2B companies) will need to design their landing pages for lead generation. Frequently, this is accomplished by offering something of value, such as a white paper or a spot in a webinar, in exchange for contact information. People who sign up for your guide or webinar make good leads because they are showing interest in the expertise that you can offer. For lead gen companies, your cost per acquisition should be less than the lifetime value of a new client. E-commerce landing pages: E-commerce companies will be using their landing pages to sell products online. Amazon is a classic example of a company with hundreds of thousands of e-commerce landing pages. The goal of an e-commerce landing page is almost always a product sale. For this reason, your CPA (cost per acquisition) needs to be lower than your product price in order to achieve ROI. Squeeze pages: A squeeze page is a landing page designed to capture opt-in email address from potential subscribers, so that you can later market to them via your email list. You can use the Landing Page Grader to check and improve your landing pages regardless of the type of landing page or your business goals. Many businesses fail at PPC because they can’t close the loop – even if they’re bidding on the right keywords and have written compelling, clickable PPC ads, they lose the sale once the visitor is on their site. A well-designed, conversion-optimized landing page is the last piece in the PPC puzzle. Once you’ve convinced someone to click from the search engine to your site, you need to convince them to take action – usually by filling out a form to become a lead. And you accomplish that with landing pages. But landing pages are a constant challenge for advertisers – they’re resource-hungry, you can’t build them in AdWords, and if they don’t follow PPC-specific best practices, they won’t work for PPC. It’s Complete: PPC Advisor is a start-to-finish PPC management solution, with all the tools you need to get started in PPC and then cross the finish line. (You can’t do this in AdWords!) WordStream also provides a ready-to-use hosting environment, while enabling you to publish to your own subdomain. It’s Simple: Landing Pages & Leads empowers you to create, edit and publish effective PPC landing pages, using a step-by-step wizard, without requiring the involvement of your IT team. It’s fast and easy – no more excuses for sending PPC traffic to your home page! 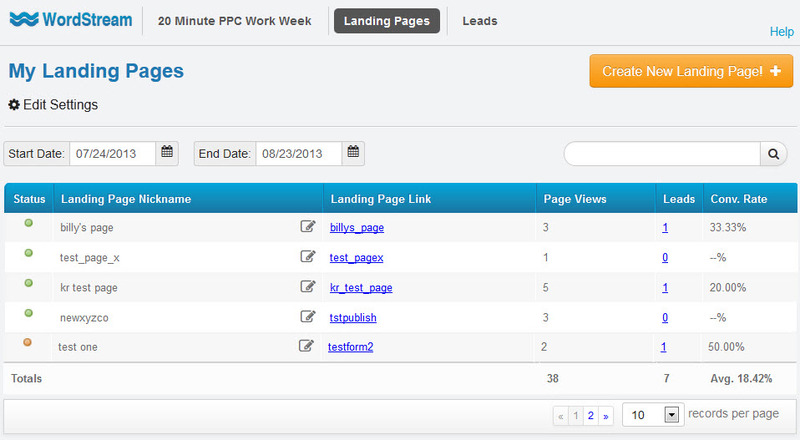 It’s PPC-Specific: Landing Pages & Leads is designed specifically for PPC. It bakes in best practices for PPC landing page layout and design and ensures that your landing pages meet Google Quality Score guidelines and are optimized for conversions. In addition, Landing Pages & Leads gives you detailed lead tracking information for deep insight into which keywords and landing pages are driving the best results for your business. You can check your landing page conversion rates, dig in for more details on specific leads, and export all your lead data – so you not only drive more leads through PPC, you can understand why you got them. Landing Pages & Leads includes an easy-to-use landing page builder that guides you through the process of creating a well-designed, conversion-optimized landing page in four simple steps. This intuitive point-and-click interface has a preview on the right, so you’ll be able to see what your landing page looks like as you build it. The first step is to define the look and feel of your landing page. Here you can write the headline and body copy that will appear on your page. The goal of this copy is to paint a compelling picture of your offering so that your prospect wants to complete your desired action. Your headline will do most of the work, so focus on writing a strong headline that is clearly relevant to your keyword and ad text – Google looks for relevance between these three elements when determining your Quality Score. For the body, write clear, concise copy that communicates the unique benefits of your offering, so users want to take the next step. Along with the headline, the form is one of the most important levers on your landing page. A well-designed form can have a huge effect on your conversion rates. Choose the fields you want to include and which fields will be required, including standard fields and custom fields. 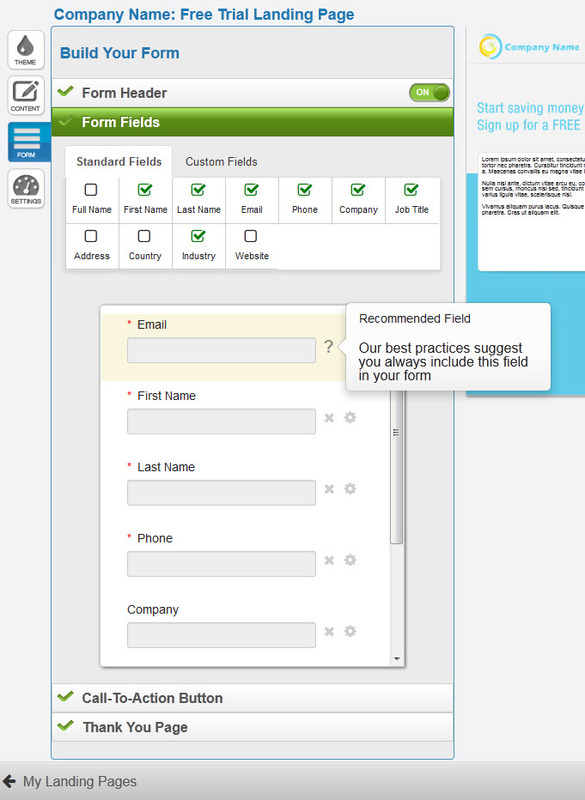 Choose a call to action for your form button – tell users what they’ll get when they complete the form! Create a thank you page that users will see after clicking the button. You can upload an asset, such as a white paper, and paste in your conversion code so you can track form completions. Step 4: Adjust Your Landing Page Settings and Publish! In the final step you can adjust your landing page settings. 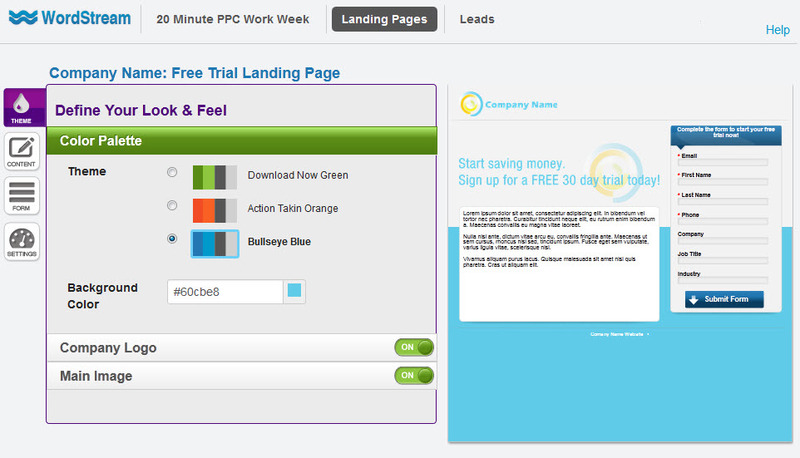 Now you’ve got a conversion-ready landing page! It’s completely DIY, no graphic designers, developers or other IT staff required. Over half of AdWords advertisers don’t even have conversion tracking set up in their accounts, which means they don’t know what’s working and what isn’t. You can’t improve your conversion rates if you don’t know what they are in the first place. Get detailed lead tracking information for deep insight into which keywords and landing pages are driving the best results for your business. Check your landing page conversion rates. Export all your lead data. 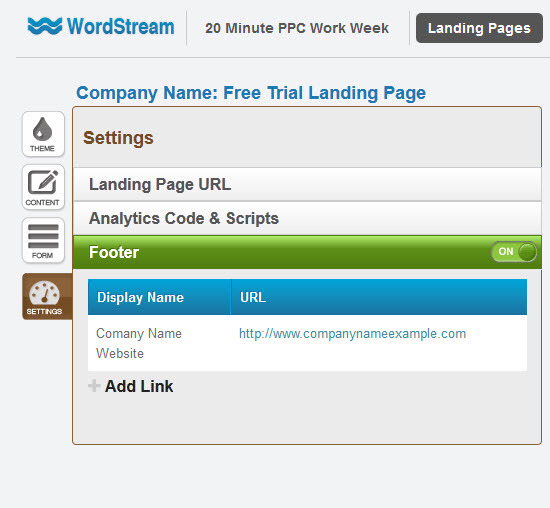 To see how easy it is to create a landing page with WordStream, try Landing Pages & Leads yourself – start your free trial of PPC Advisor now.